Some tidbits you will find interesting about this holiday and its fantastic feast! Happy Thanksgiving! It’s hard to imagine the turkey as the official bird of the United States, but if Ben Franklin had had his way, it could have been. In a letter to his daughter, Franklin referred to the turkey saying, “I wish the bald eagle had not been chosen as the representative of our country! The turkey is a much more respectable bird, and withal a true original native of America.” Hmmm. 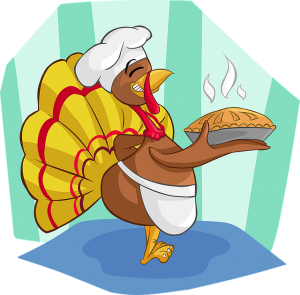 Last year there were 254 million turkeys raised in the United States, which is up 2 percent from the previous year. The most popular state for raising turkeys was Minnesota, which raised 46 million turkeys last year. Minnesota, along with North Carolina, Arkansas, Missouri, Virginia, Indiana and California, accounted for 70 percent of the turkeys raised in the United States last year. According to the Guinness Book of World Records, the largest pumpkin pie ever baked weighed 2,020 pounds and measured just over 12 feet long. It was baked on October 8, 2005 by the New Bremen Giant Pumpkin Growers in Ohio, and included 900 pounds of pumpkin, 62 gallons of evaporated milk, 155 dozen eggs, 300 pounds of sugar, 3.5 pounds of salt, 7 pounds of cinnamon, 2 pounds of pumpkin spice and 250 pounds of crust. Hungry? Don’t forget the sides! Cranberry production in the U.S. is expected to reach 750 million pounds in 2011. Wisconsin, Massachusetts, New Jersey, Oregon and Washington are the top cranberry growing states. The sweet potato is most plentifully produced in North Carolina, which grew 972 million pounds of the popular Thanksgiving side dish vegetable in 2010. Other sweet potato powerhouses included California and Mississippi, and the top producing states together generated over 2.4 billion pounds of the tubers. The first time the Detroit Lions played football on Thanksgiving Day was in 1934, when they hosted the Chicago Bears at the University of Detroit stadium, in front of 26,000 fans. The NBC radio network broadcast the game on 94 stations across the country–the first national Thanksgiving football broadcast. If you can’t make it through the daylong celebration of food, football and family be thankful that you weren’t around for the first Thanksgiving. That celebration took place in the fall of 1621 in Plymouth Colony between European settlers and the Wampanoag Indians and it lasted three days. More than 200 years later, President Abraham Lincoln declared the final Thursday in November as a national day of thanksgiving. Congress finally made Thanksgiving Day an official national holiday in 1941.